Go to national.org.nz. 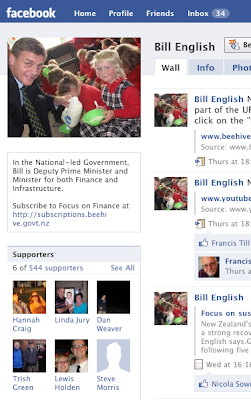 OK - don't; but here's what I found, or rather, didn't find: I tried clicking through (on the top left) to johnkey.co.nz and billenglish.co.nz yesterday and got a disconnected signal. Nothing. Tried again today. Nothing. Nothing. Is something up? It's a bad look for the main site to be linking to the leadership websites when they are offline. People begin asking themselves why. They are not being redirected and I doubt that all the horny housewives of middle America googling that spunky John Key who was on the Late Show (if you believe the comments from the audience made to NZ TV outside the taping) is enough to account for a traffic-related collapse of the server. Could be nothing... could be everything. His Facebook is functioning. With 15,297 supporters someone might notice if that went down. He's had posted up his meeting with Obama and his sideshow appearance on Letterman. Both Americans are asking themselves the same thing: "Why is he out here?" I note the chair of the Republican movement is registered as being a supporter (bottom left). Of both. Not that it really means anything, in the few minutes after capturing that image I see the fearless Leftist, Tane (the other one, not the Standard one), has joined the support group too. "And why he's bidding for a seat at the UN Security Council for NZ after declaring our undying love for the US-Israel bloc the other day at the General Assembly"
Maybe Key should declare his undying love for the Iranian or North Korean regimes regimes them. I sure that would be awesome. Have you actually met Key?